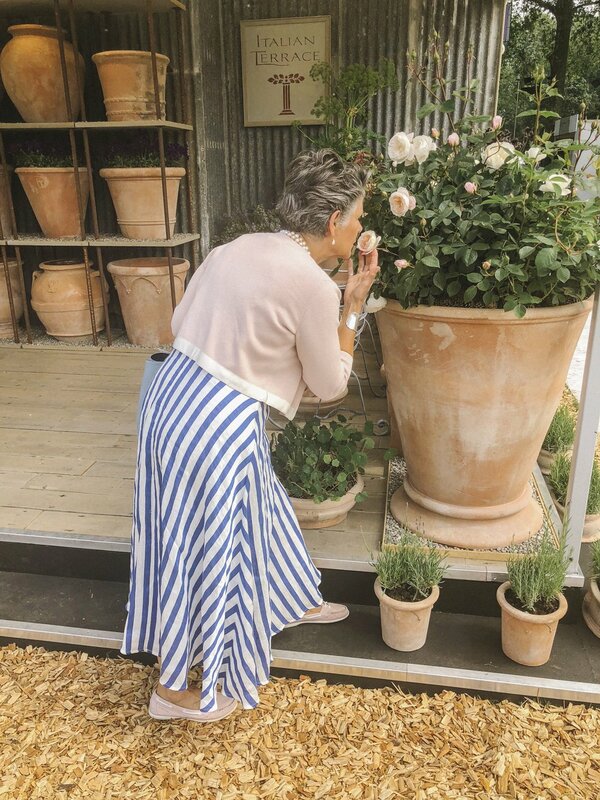 This week sees the launch of the 2018 RHS Chelsea Flower Show. Which for mum and I means slipping on summer dresses, our most sensible shoes and making a beeline for Chelsea Embankment, cameras, note books and measuring tapes in tow. Today we were lucky enough to be treated to a cheeky preview of the show, which opens to the public tomorrow. I know many of you are huge fans, so I won’t spoil anything… but can’t resist sharing a few favourite bits! The day started, as all of the best days start, with ice creams. Which we strolled through the various competing gardens with. My first favourite of which, is the Wedgwood Garden, designed by Jo Thompson. Beautiful wildflowers surrounding burbling water, as a violinist serenades the birds and the bees. Chelsea looking particularly fine in the British sunshine. The completely self sustainable LG garden, complete with solar panels and fish pond, who’s inhabitants feed the herb garden. The only garden to stray from the pinky-purple pallet seen across the show this year, opting for bold oranges and sunny yellows. Very much at home among the Chelsea Pensioners! Another firm favourite of mine was the South African Garden, designed by Jonathan Snow. But perhaps I’m just swayed by the romance of that little thatch cottage. “Welcome To Yorkshire” by Mark Gregory. A little slice of northern life brought to life in London. A babbling stream, foxgloves waving in the breeze, buttercups, daisies and even a little vegetable patch. I would move in tomorrow! May, being a Yorkshire Lass, heartily approved. Inside the pavilion we revisited old favourites, rose gardens, iris displays, foxgloves so tall they make you feel like Alice in Wonderland. It was beautiful to see the deeply British, seasonal, unkempt, wild trend is still going strong. I so prefer it to the manicured perfect look, don’t you? We ooed and ahhed, shopped and lusted. I always particularly love the romantic names chosen for flowers. Back outside we paid one last visit to the competitors’ spaces. Before finally making our way over to the shopping bits! Which is really the icing on the RHS Flower Show cake, if you ask me. We fell in love with fountains, sculptures, swings and greenhouses. For £20,000 your little darlings can have a copy of your townhouse (or country house!) of their very own, by Wallgarden. That’s if you’ll ever leave for long enough to let them have a go! Pop over to my Instagram page to see videos of the day, I’ll put them all in my “Highlights”. Here’s to the start of a wild week in Chelsea!